Getting the train to the airport is quick, easy and convenient – or so we’re told. Many airports have railway stations, and most of those that do enjoy a fast and frequent train service. Many of our busiest airports are deemed worthy of an express too – Heathrow, Gatwick and Stansted spring to mind. Even smaller airports like Prestwick have a respectable train service. Tucked away in a quiet corner of the north-east of England is Durham Tees Valley Airport, which has had a fairly chequered history. 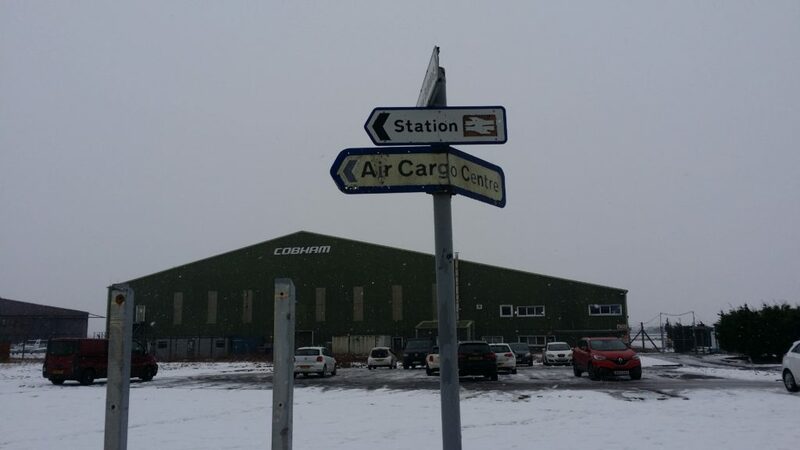 Originally an RAF airfield, it opened to the public as Teesside Airport in 1964, gaining its current name in 2004, although it’s not particularly close to Durham, Darlington being the nearest city. Although nearly a million passengers used the airport in 2006, by 2013 numbers had dropped to 161,000. There’s currently flights to only a few destinations, but KLM provide three flights a day to Amsterdam with a wide range of onward connections. It’s certainly one of the UK’s smaller airports, and a sleepy atmosphere prevails. Unless you happen to be very local, it’s probably much easier to use Newcastle Airport, which has a much wider range of destinations. Anyway, in 1971, the airport was blessed with its own railway station. 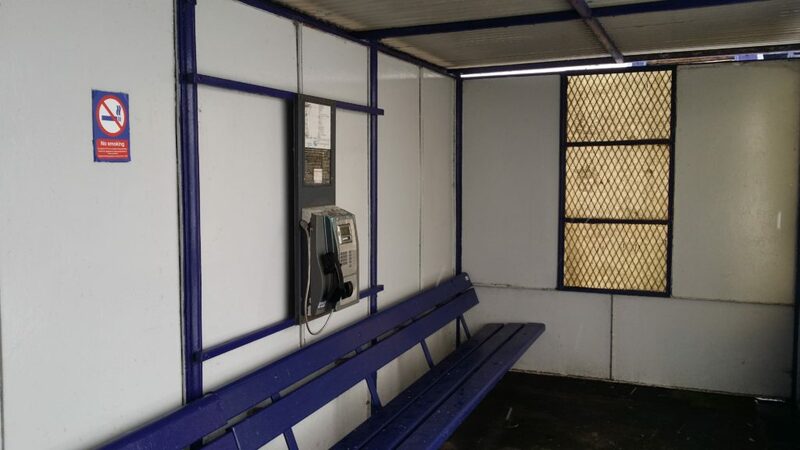 Originally it enjoyed an hourly service, but by the early 90s, it had been drastically cut back. Most airport users found it easier to travel by bus, as the station was quite inconveniently located, especially if you had bags to carry. It’s a long walk to the terminal, especially in bad weather – but more of that later! Eventually the station became notorious for being served by a minimal train service, and it regularly came close to being the least-used station in the country. 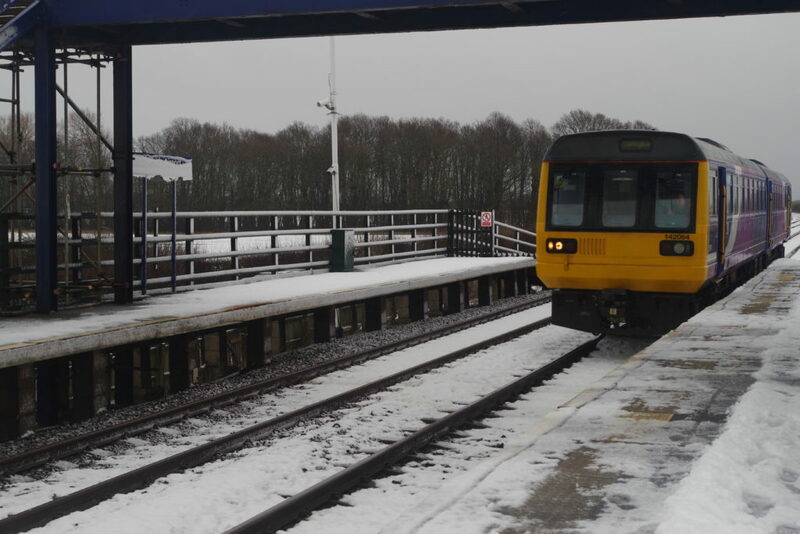 Served by only one train in each direction on a Sunday, a mere 30 journeys were made to and from the station in the 2015/16 financial year, making it the second quietest station in the country, behind Barry Links in Scotland with 24 users. 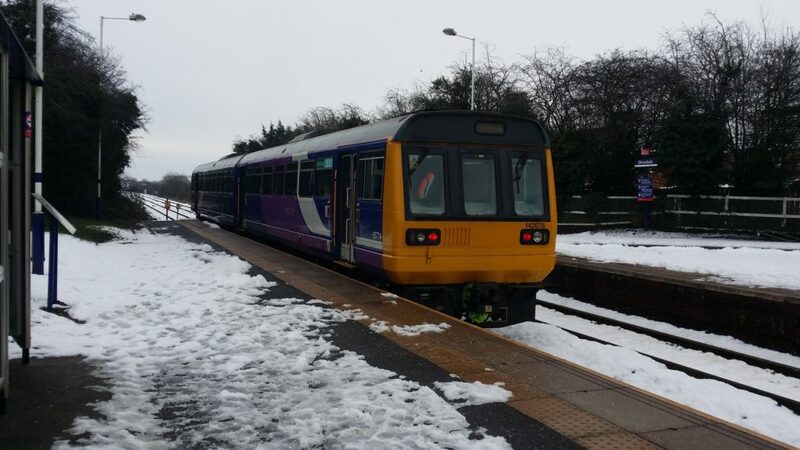 It doesn’t look like things are going to change any time soon – the airport remains quiet, and in December 2017, the service was reduced to a mere one train a week, the 14.56 to Darlington on Sunday afternoons. 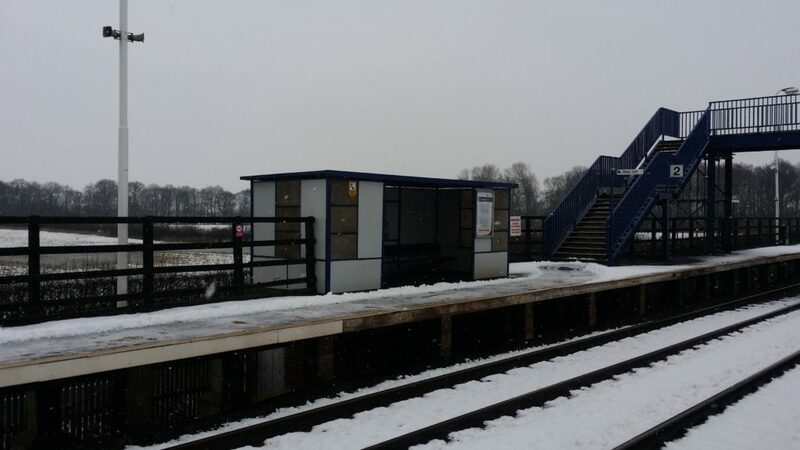 This was due to concerns over the state of the footbridge, so only one platform is now in use. Why persist with such a lousy service? It’s mainly because closing railway stations is controversial and expensive, and involves a long-winded process with no guarantee of success. Sensitivity over Beeching’s legacy, and a generally busy network, has made station closures in the UK extremely rare. One train a week is considered the minimum you can get away with to count a station as “open”, and there’s a few that have this utterly minimal level of service. Needless to say, none of them are busy. They’re generally referred to as Ghost Stations, and they’ve developed a bit of a following. Given my love of obscurity, it was inevitable I’d end up visiting eventually, and on 21st January 2018, I did. I started off on the 09.30 from Edinburgh to Darlington, a Virgin Trains East Coast service. Generally I find Virgin to be comfortable and pretty good, but I have to say I find their marketing and communications extremely grating – it’s all a bit too zany and wacky for my liking. Still, the journey went well and it was quite enjoyable. At Darlington, I took a Northern service to Dinsdale, just a few minutes up the line. Given that Teesside Airport is only served in one direction, I had to make my way on foot from there. My train leaving Dinsdale. As you can see, there was a bit of snow around, but the weather wasn’t too bad at this point. It didn’t take me long to find the right way to go, and I walked to the airport in about forty minutes. It was a bit icy but I got there in one piece. There is a local bus service, but it rather unhelpfully doesn’t run on a Sunday. The village around Dinsdale station is fairly small and I was soon out in the sticks a bit, but soon came across the airport buildings. …but there were plenty of signs. Eventually found the station approach road. Clearly someone had cleared the snow away, which was falling pretty steadily by the time I arrived. The road runs between two chainlink fences, the airport runway is off to the right. The way in…the ramp was icy, but I made it alive. Evidence that someone had pulled up here in a van. 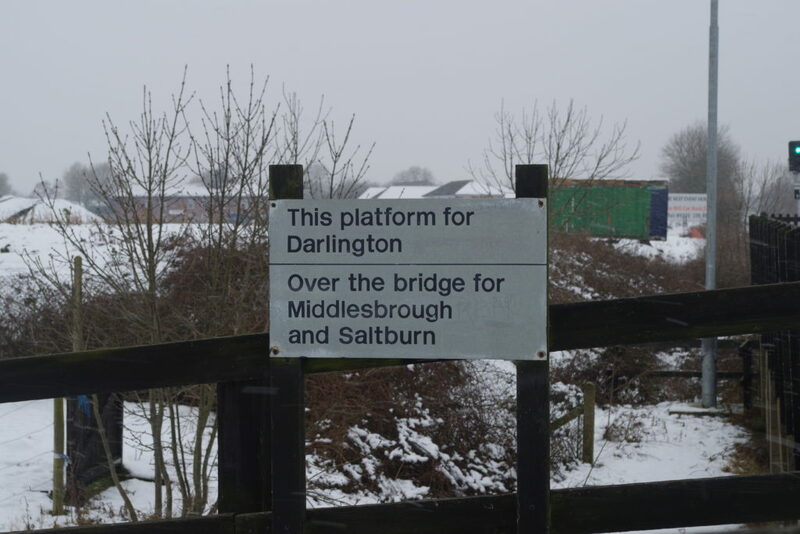 This sign is a bit optimistic – trains to Middlesbrough and Saltburn no longer stop here. …and this notice doesn’t inspire confidence in the footbridge. 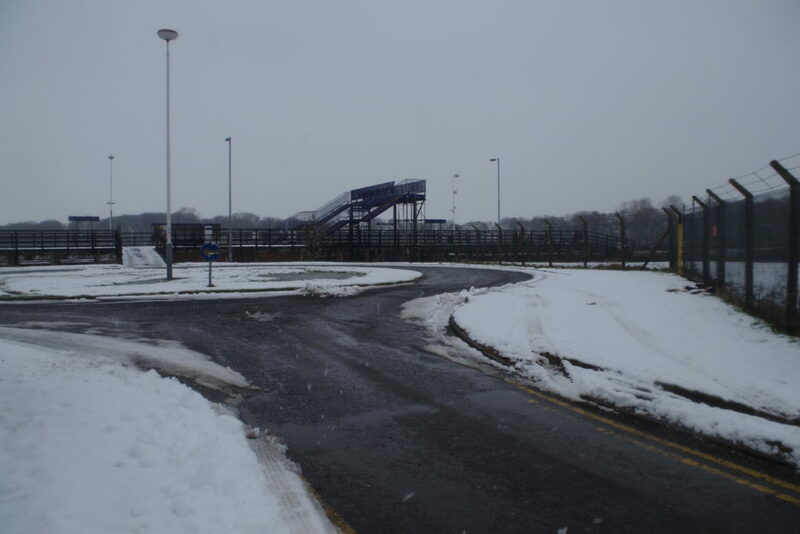 I went over to have a look, though (and take cover from the snow). Check out the state-of-the-art facilities! Nice view. Note the scaffolding poles propping up the footbridge. 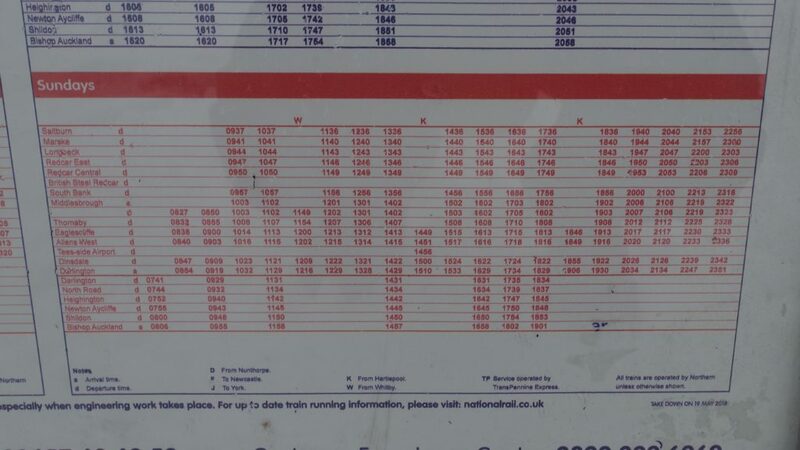 Timetable poster showing the one train a week to call. 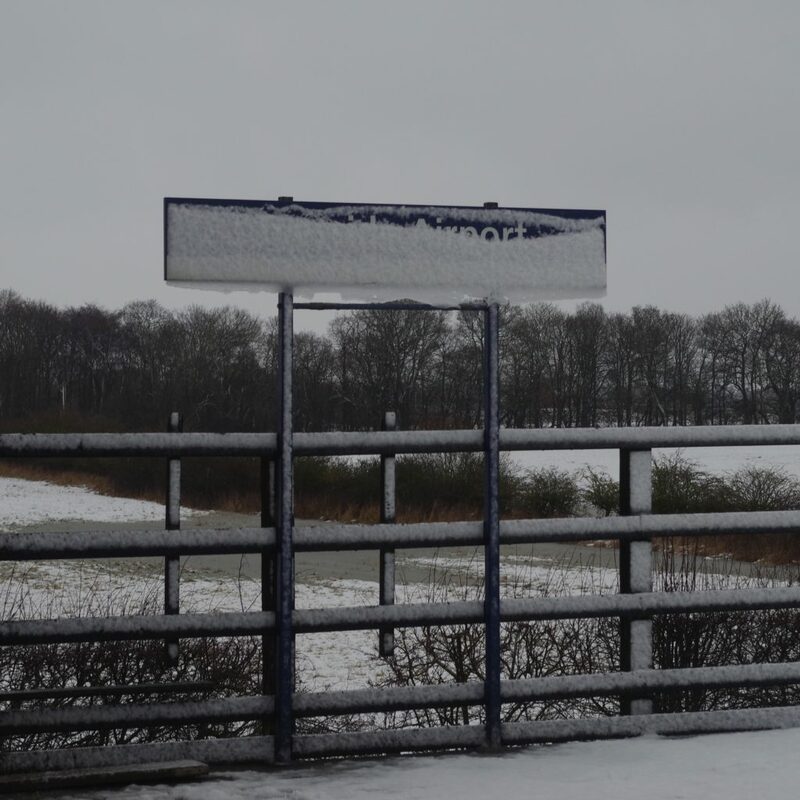 My plan was to catch the 14.56 back to Darlington, but by the time I’d finished my initial explorations and taken some pictures, it was only about 13.00, and by that time it was snowing heavily and about as cold as it looked. I decided it was time to find shelter, so I went to explore the airport terminal building. The main challenge was finding it first. It’s a long way from the station and it isn’t signposted. I hadn’t passed it on my way there. 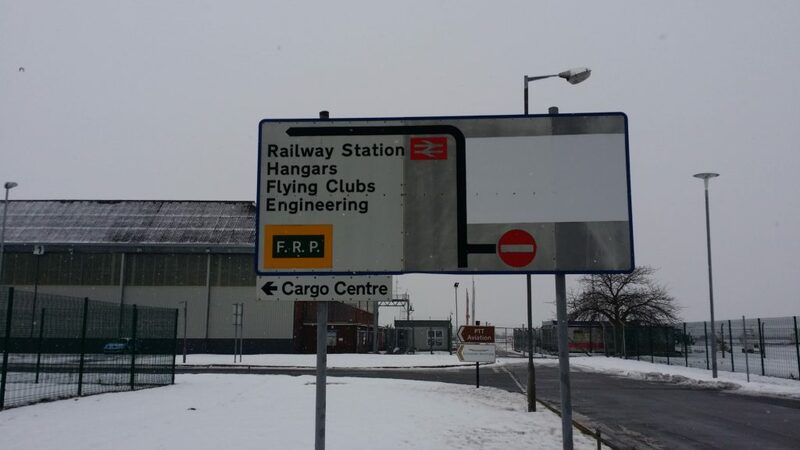 The buildings around the station are industrial units, cargo handling facilities, and airport maintenance buildings. It didn’t take me too long to find, but it was perfectly possible to get lost. The walk was about fifteen minutes, and went through a bleak and exposed area, so it was no fun in the snow. It would have been even less so with a heavy suitcase! The flight information screens told me there were a few flights after about 5pm, with check-in opening at 3.10pm. I assume the other facilities would have opened around the same time. I availed myself of the tables and sat down for a bit, but I remained cold and damp and hungry. There was no-one around for ages – it was quite weird actually, the whole place was open but I had it all to myself. I noticed that all departing passengers have to pay a £6 fee, which can’t do much for the airport’s popularity. Still, I suppose it is just about possible to use the train to travel to the airport for a flight – by the time you’ve walked over, you’d be there just as check-in opens. It’s actually the only public transport to the airport on a Sunday – the bus services only run Monday to Saturday, so if the train doesn’t work for you, your only options are to drive or take a taxi. The airport’s website doesn’t mention the station, and as you’ll notice, the station wasn’t renamed when the airport rebranded itself in 2004. 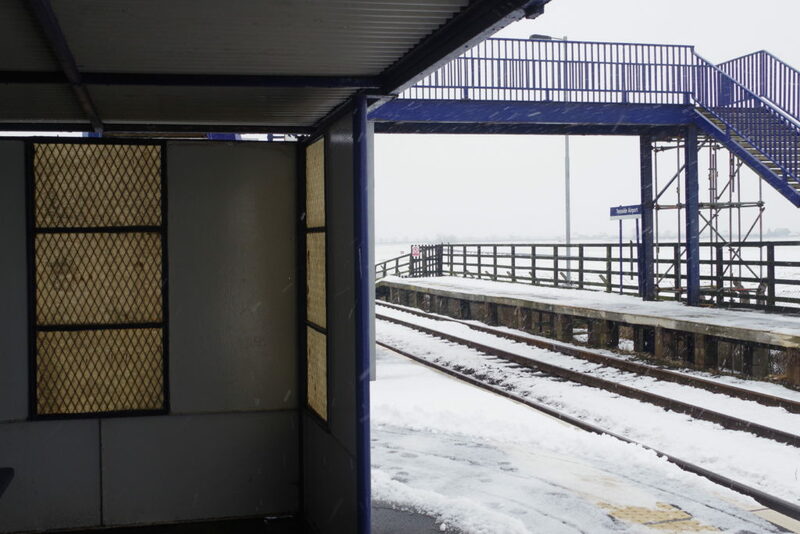 Given the railway’s propensity to grind to a halt after about three flakes of snow have fallen, I was a bit concerned about getting trapped, but the National Rail app showed me the train left Hartlepool on time, so I then walked back to the station to catch it. I arrived quite early, like I always do, so I took cover in the shelter. About ten minutes before the train showed up, a taxi arrived and a photographer got out – I was quite annoyed to find the place so crowded! I really wanted it to myself! There ends my chilly adventure. Back at Darlington I got some belated lunch, and waited for my train home to Edinburgh, which ran bang on time despite the awful weather. It was all good fun – yes, fun. I know this probably looks completely bonkers to most people, but I love exploring obscure places like this. I think it raises some important questions. Given how busy and crowded most of the railway is, and given how expensive it is to run, I’m of the opinion that it’s high time someone closed stations like this. Honestly, it’s no good to man or beast. The conductor didn’t actually sell either of us any tickets on the short run back to Darlington, so that’s two journeys that won’t show up on the official record, but even if that happened a lot, the number of people using this station is tiny. It’s a long way from the airport terminal, there’s nothing else there apart from a few industrial buildings, at least one of which is abandoned, and the station’s existence seems to be a closely-guarded secret. Even if every train stopped there, it would still be inconvenient, if you had luggage or if it was raining or snowing. There’s no really easy way of moving the station closer, and the airport isn’t busy anyway. Even basic facilities like these cost a lot to maintain – around £40k a year! There’s not much there, but someone has to go and clean (and shovel snow) occasionally, so they drive there in a van, use up cleaning supplies, and get paid wages. 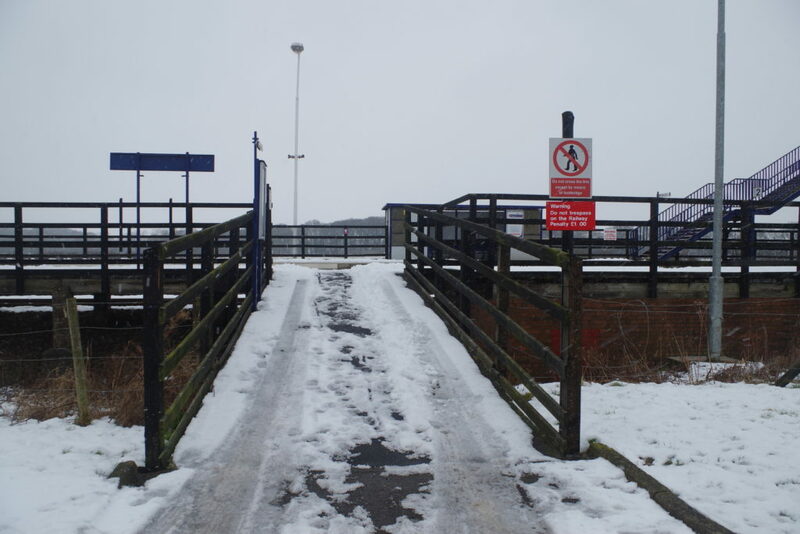 Apart from the dodgy footbridge, all the signs were in good condition, all the posters were up-to-date, the shelter was clean and dry, and the access road had been cleared of snow. Each of the 30 paying users last year was therefore subsidised by over a grand each – that’s a lot of money. Is it being wisely spent? 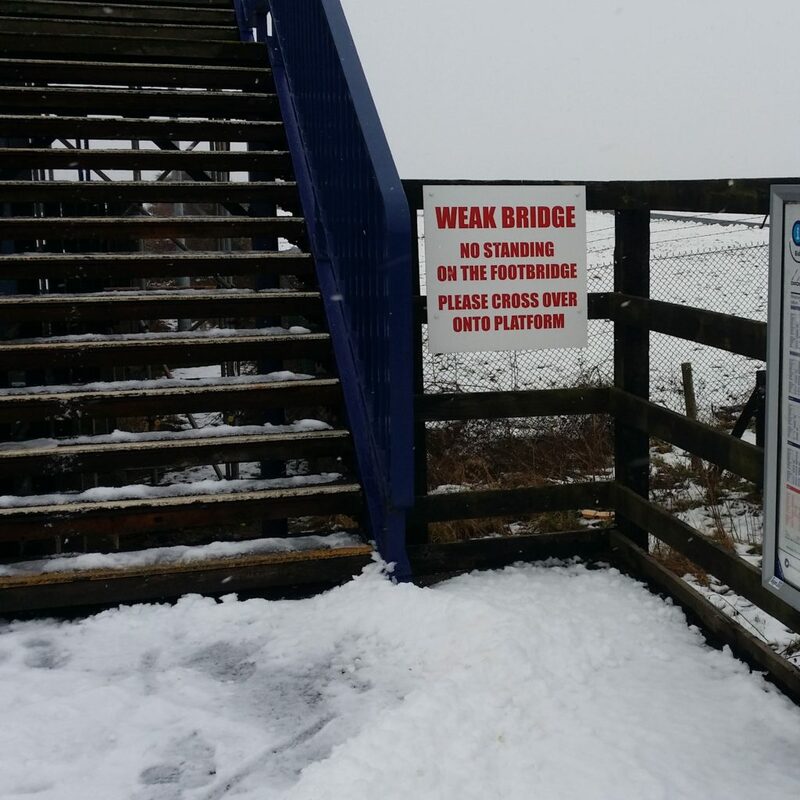 A similar station close to me, Breich in West Lothian, is served by one train to Edinburgh and one train to Glasgow a day, and attracted a dazzling 48 users last year. Network Rail proposed closing it, but the Scottish transport minister refused permission. The station needs to be rebuilt as the current footbridge is too low to allow electrification equipment to be installed – this work is currently taking place on the line. Rebuilding the station will cost two million pounds. The village has a population of about three hundred, and has very good local bus services that are far more convenient. I’m as pro-rail as anyone, but this strikes me as an absolutely scandalous waste of money. It would be far better spent elsewhere. But hey. I’m not in charge, and while places like this continue to exist, I’ll continue to visit them. 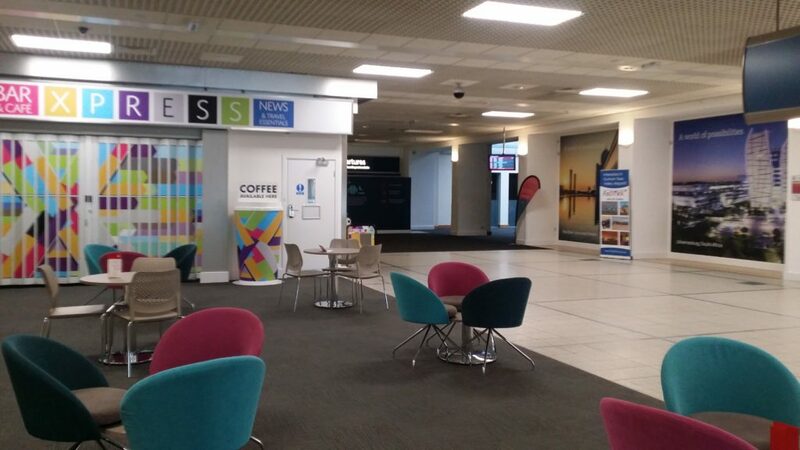 If you want an example of a busy airport with no railway station, then try Leeds Bradford airport. Regular buses operate from Leeds railway station and Bradford Interchange.